The Saint promised that barbarian, that if he did not touch her, she would give him medicine that would protect him from every sword and arrow of the enemy. Saying this, she also promised saying, "If you want to find out what I tell you is true, try it on my neck," and immediately she laid bare her neck. The barbarian, thinking that she was speaking words of truth, struck with strength at her neck with his sword, and he cut off her holy head. 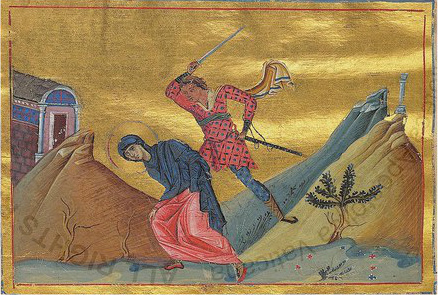 In this way she remained undefiled, and the blessed one received the unfading crown of martyrdom.